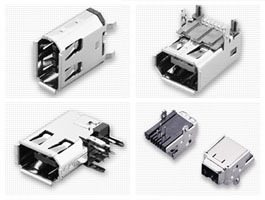 ACON Offers a full line of external I/O connectors based on IEEE 1394 standard. The 4-pin, 6-pin and 9-pin (1394b) I/O connectors are available in both plug and receptacle. Receptacles are offered with high temperature plastic for true SMT processing. Fully shielded metal frame of the receptacle is for ESD protection. Rugged gold plated terminals withstand up to 1500 mating cycles with less than 30 milliohms.